If you’re one of those drivers that’s constantly looking for ways to make your vehicle command attention on the road, you’ll probably be happy to hear about Toyota’s latest Nightshade special editions. Announced at the same time as this year’s daylight savings switch, the Nightshade editions lend some seriously stylish flair to a select few of Toyota’s vehicles. Here at Westbury Toyota, we are more than impressed with these new editions and we’re very excited to show them off to our customers. If your interest is firmly piqued, keep on reading to see exactly what the Nightshade packages entail. You may find yourself enticed enough to come on down and see one for yourself in person! 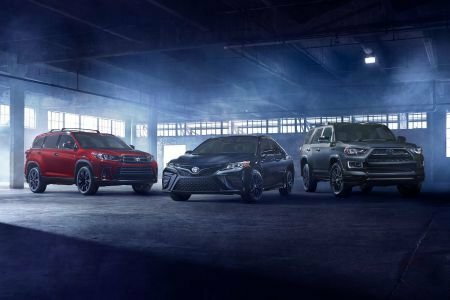 The Nightshade special edition was already announced in October for the 4Runner, and now is available for both the Highlander and the Camry (SE trim levels only). The Nightshade editions are all about emphasizing the visual aesthetic of the vehicle, and they do that in a number of different ways for each car. Any of the three paint options looks incredible with the black finishes and detailing, but you really can’t get an idea of the effect until you see it in person. If you’ve been eyeing up a new Camry and think now might be the time, please don’t hesitate to pay us a visit so we can tell you a little more about this special edition. There will only be about 5,000 Nightshade Highlander models produced, so if you’re very interested in owning one, it’s better to act fast than to wait and be disappointed! Though the Nightshade edition for the 4Runner was announced earlier this year, it’s just as impressive as the Camry and Highlander editions. There are black accents on both the rear and front bumper spoilers, the sideview mirror covers, the roof rails, the window surround molding, the side sills, the exhaust tips, and the badging. What’s more, there are 20-inch black wheels, LED tail lights, and a front fascia with projector beam headlights. When it comes to exterior paint options, you have three for the 4Runner (all of them equally impressive): Magnetic Grey Metallic, Blizzard Pearl, and Midnight Black Metallic. While there’s definitely more to a vehicle than what’s on the outside, to some people the appearance is what matters most – and there’s nothing wrong with that! If you’re that type of person, the new Nightshade editions for the 4Runner, Highlander, and Camry might be right up your alley. If you’d like a more personal, in-depth, and up-close look at these new special editions, come and see us at Westbury Toyota. We’d love to show you more, answer any questions you might have, and get you better acquainted with everything the Nightshade editions have to offer!